ASTORIA, NY-- August 14, 2009. Astoria Park in the summer usually bustles with the footfalls of toddlers on the playground and runners on its many trails. Sometimes, it just breathes with people looking out on the pool or the East River. On August 14, however, its serene visitors will be replaced with modern-day abolitionists, social activists, and anyone who might be passing by during the three-hour event from 6:30-9:30 pm. 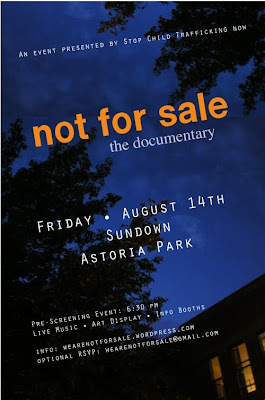 Astoria Park will become the location of an outdoor film screening of “Not For Sale”-- a documentary by Robert Marcarelli on modern-day human trafficking. Inspired by faith, civic responsibility and compassion, a group of volunteers-- calling themselves “We Are Not For Sale”-- have organized the movie screening which will run from 8:00-9:30, employing what can be called “open-source activism”. Groups like Invisible Children and ONE have come to the forefront of popular culture using this creative activism, partnering with actors and meeting target audiences where they sit. Rather than picket-protesting, open-source activism aims to bring social injustices not just into light but into the creative intellect and active lives of others. “We Are Not For Sale” is bringing the reality of modern-day slavery to Astoria Park through emails, letters, musicians, artists, writers, Facebook, WordPress, and with 11 partner organizations, to the citizens of New York and to anybody who might somehow learn of this activism and what it is for. It is for the 27 million slaves being trafficked worldwide at this very moment. An estimated 200,000 of who pass through the United States before reaching their destinations abroad. “We Are Not For Sale” will be sharing the personal stories of those slaves, our privilege in declaring, “We are not for sale”, and the work of modern-day abolitionists towards a universal declaration of such. From 6:30-8:00, live musicians and artists will host pre-screening performances and sales to fundraise. Information booths will also be available for those interested. The movie runs from 8:00-9:30.